Paige doesn't have a date for the school dance. She fears that no one will ask her. Would Logan or Cullen ask Paige, or would Brett ask her? Then Paige finds a slip of paper in her science book. It's a note from her secret admirer. Did Logan write it, or was it someone else? Carter High is a typical high school. The students of Carter attend classes, participate in sports and drama, cram for exams, and go on field trips. 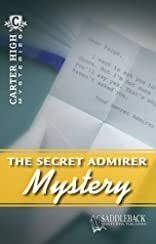 Topics are involving and pertinent to young adult readers but with a twist of mystery. In just 48-pages, even your struggling readers can easily finish these novels! Carter High Chronicles. Meet the students of Carter Highthey are a diverse group of teens from a variety of backgrounds. Each paperback book features a character embroiled in a typical high school dilemma. Topics are involving and pertinent to young adult readers: romance, sports, friendship, exams, work, family. In just 48-pages, even your least motivated readers can easily finish.